93 total news articles in this section, 10 per page. Longtime fan artist Cheetimus has provided a sighting, but not just any sighting, oh no. He's presented, with photographic proof, the first US retail sighting of Combiner Wars Deluxe Wave 1, at his local Target in Maryland. Wave one consists of three Aerialbots (Firefly, Sky Dive, Alpha Bravo) and one Stunticon (Dragstrip), all of which combine with Voyager Class Optimus Prime to form Ultra Prime, which you can see in our galleries here. It may seem odd that an East Coast store would see a sighting of these first, but I was the first to find Energon Leader Class Galvatron all those years ago and in PA no less, so it's not unheard of, just rare. If you have a sighting such as this, share it with us at sightings@seibertron.com and remember to post your findings in the sightings forum as well, and if you have anything news, please send it to news@seibertron.com and you could see your name up here and earn a news credit! Not only are Transformers Generations Combiner Wars Voyager figures showing up at UK retail, it appears that the same chain - Smyths - is also starting to stock the Deluxe toys too. The images below come from fellow Seibertron.com user Primacron's Little Helper, and the comments are from the UK Sightings thread - make sure to flag up any sighting of these newcomers in the appropriate section and forums! Update time. I've been in touch with the manager of the Cardiff store, they've had a delivery today and are expecting two tomorrow. He said they had Skydive and Fireflight. Assuming that all four deluxes are packaged together that must mean that they are on the pegs (didn't ask ) and the others have sold out, I think. He's put aside those two for me and will put aside the others if they come in (long story but suffice to say, a favour is the least they owed us ). So, I'll find out what's there Saturday morning when I go to pick stuff up. I'm telling you this because I don't believe for a second that this is the only Smyth's getting all these deliveries so, without wanting to give false hope, it may be worth staying in touch with your local store if you want CW for Christmas. I've just got back from Smyths and they had all 4 deluxes in stock, I grabbed the three Aerialbots, but passed on Drag Strip. I got the last Skydive and Fireflight so might be worth getting them to put Slingshot and Dragstrip aside for you as well. Wave 1 sans Bumblebeefound at Peoria,IL TRU at 8pm central 12.13.14 $14.99 each. Hopefully these figures will be available in time for last minute Christmas shopping. If you have a sighting, please share it with us via sightings@Seibertron.com and remember to share your findings in our sightings forum. Keep your optics tuned to Seibertron.com for the latest in need and updates, plus the best galleries around! 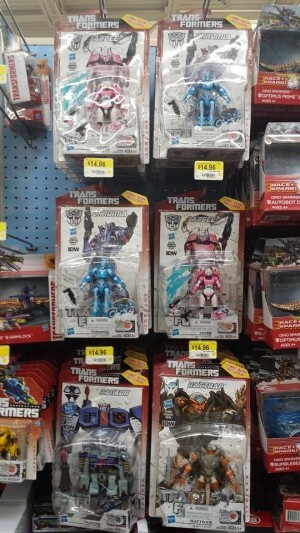 The wait is over ladies and gentlemen as Seibertron.com member Balanon Joe have spotted Generations Arcee and Chromia at a Walmart in Phoenix, AZ! Will you be picking these new generations figures up? Let us know in the Seibertron.com forums here, and remember keep your optics tuned to Seibertron.com for the latest in news and updates, plus the best galleries around! 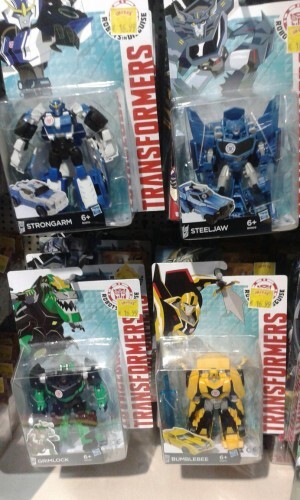 We've seen in hand images of the upcoming first wave of the Transformers: Robots in Disguise Warrior class already, but Seibertron.com user leokearon has shared another couple of comparison shots and packaging views - after having spotted Grimlock, Bumblebee, Strongarm and Steeljaw at Smyths in Ireland (priced at €16.99, approx $20)! They are also available on their online store, including Warriors, Legions and One-Step Changers, could this also mean they'll be hitting other European retailers soon? Let us know if you spot any across the world via our Sightings section and forums. 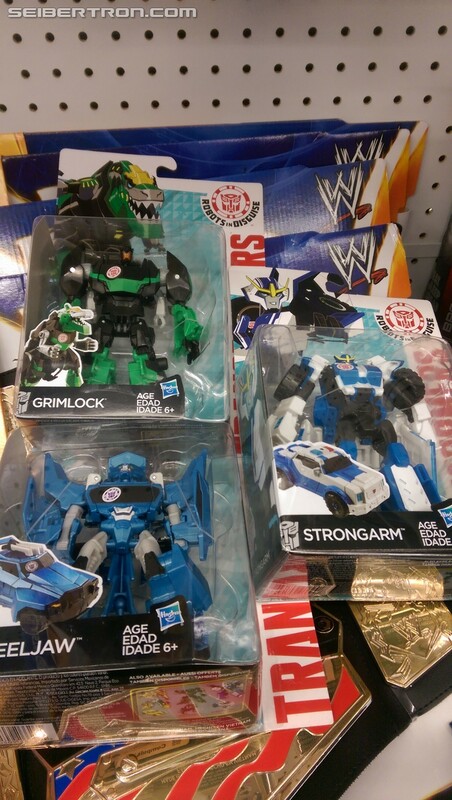 We don't have an exact location, but it appears that some Toys'R'Us stores in the US have started stocking the One-Step Changers from the upcoming Transformers: Robots in Disguise animated series. 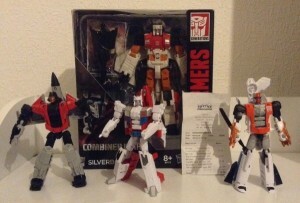 The photo proof below, of Strongarm, Bumblebee, Sideswipe and Underbite, comes via the Facebook group Transformers Addicts! and its member Richard Puente. If you spot any of these in your area, make sure to flag them up in the Sightings section and forums! 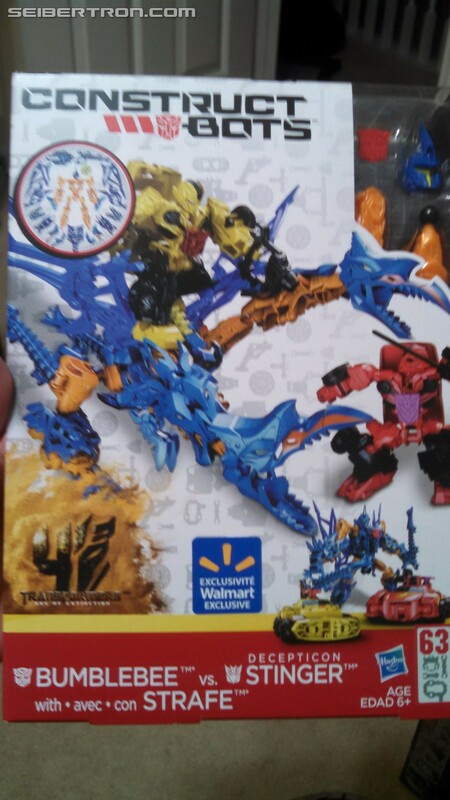 With the Age Of Extinction toyline coming to a close, news of finding new toys for it isn't exactly something you'd expect to see right now, but considering it's a Construct Bot set? Even more surprising. Well, that's exactly what we have to share with you today! Oh look, something else I didn't know existed! Walmart exclusive AOE Construct Bots Bumblebee with Strafe vs. Stinger. BB Rider figure is a slight redeco. Strafe has a G2 style deco similar to the Target exclusive Grimlock Construct Bot but it's not a direct homage to a canceled toy like that one was. If you're looking for this set, now's the time to search, and if you do find it, share your sightings with us by posting it in the sightings forum! Remember, if you find something new and exciting, send an email to us at sightings@seibertron.com so you can receive credit for the find and you'll get your name posted in the article for all to see! Keep your optics tuned to Seiberton.com for the latest in news and updates, plus the best galleries around! Seibertron member Cdavid3 sent us a nice image of the Platinum Edition Optimus Prime with trailer and Sideswipe that was found at the Toys"R"Us Times Square. The set contains the Age of Extinction First Edition Optimus Prime mold with the MP-10 trailer and a redeco of Revenge of the Fallen Sideswipe. He reports that the price for the set is $196.99. 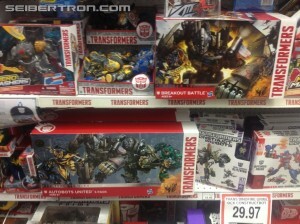 Also in the pic we see the Platinum Edition Leader Optimus Prime and Grimlock. This set was priced at $127.99 and contains redecos of the Age of Extinction Leader Class Optimus Prime and Grimlock. Feel free to send your own sightings to sightings@seibetron.com or use the Contact Us link at the top of the page. Also be sure to snap a picture of your new sighting. 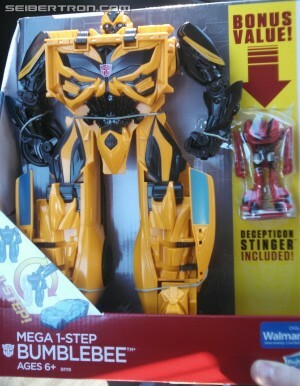 Twincast podcaster ScottyP found a new Walmart exlcusive Mega 1-step Bumblebee with bonus Legends Class Stinger at a Walmart in Raleigh, NC for $24.97. 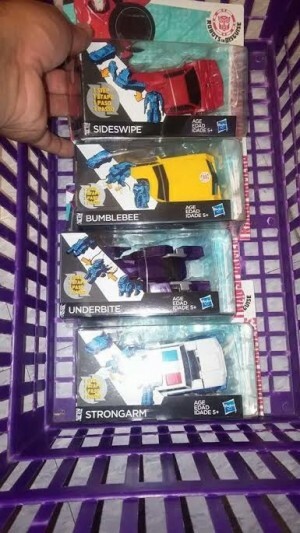 According to ScottyP the stinger appears to be identical to the single carded Age of Extinction release but Bumblebee is visibly more yellow than his previous release. He also provided us with a nice image of his find which you can see below. Please send your new sightings to Sightings@seibertron.com or use the Contact Us link at the top of the page. It's always helpful to send a picture as well. 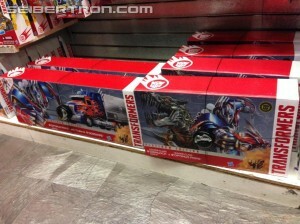 Seibertron member shajaki dropped us an email letting us know that he spotted the Autobots United 5 pack and the Breakout Battle set at retail in a Toys 'R' Us in Edmonton Canada. Time to head out to your local Canadian TRU if you have any interest in these sets. He also sent us a nice image of his find. If you have your own new sighting and think it's newsworthy to share with your fellow Seibertronians, then snap a pic and send your find to sightings@seibertron.com. You can also report your sightings and any other news using the Contact Us link at the top of the page.